Note: See Q&A 29, 39, 40 and 41 for an explanation of how this name was given, and its role in the ancient Hindu literature. This being is a great Cosmic Master who, in deep compassion for the humanity of the Earth, and empowered by full galactic authority (i.e., under the jurisdiction of karmic law, and in service for the Supreme Galactic Council), has made himself available to us for as long as it takes in order to guarantee that the Earth will ascend to the fifth dimension free from outside interference and manipulation (including from the dark forces in the lower astral realm of the Earth itself), and in accordance to certain galactic directives. For the exercise of our efforts to understand this cosmic player in familiar terms, we can say that this lifestream is a supreme Space Commander very well known in this and other galactic systems. He is a great Avatar with an undeniable record of cosmic service based on the deepest expression of love in action, serving those who are in need of spiritual enlightenment. Such a task involves a great deal of responsibility, and is the very fabric of the administration and evolution of the universe both microcosmic and macrocosmic in all senses, in every realm in which consciousness is evoked. Indeed, this Master has been dedicated to such work from the beginning of the universe as we know it; a great universe which he has helped to evolve via promoting light as cosmic consciousness. This concept is hard to grasp analytically, but it hints that consciousness is present even in the atom. Hence, the atomic scale is also to be grasped through the same ‘love in action’ discussed above. This being is neither male nor female; “he” is neither ‘this’ nor ‘that’. It would be utterly hopeless to try to put a cosmic master who is so close to the source of the very cosmos in a box or category constrained by human limitation. Within high cosmic functions the conscious energy becomes so attuned to all and everything that it can barely be recognized as an individual personality. Ashtar Sheran is a name-function that designates the supreme cosmic purpose of love in action described above. In the present cycle this function is an operation on behalf of the galaxy, helping our three dimensional world to re-gain access to the higher dimensions in which everything is connected to everything through love and cosmic brotherhood. Naturally, such colossal work is done in a concerted effort with many other beings and forces in the cosmic hierarchy, indeed resembling a symphony of love in action. 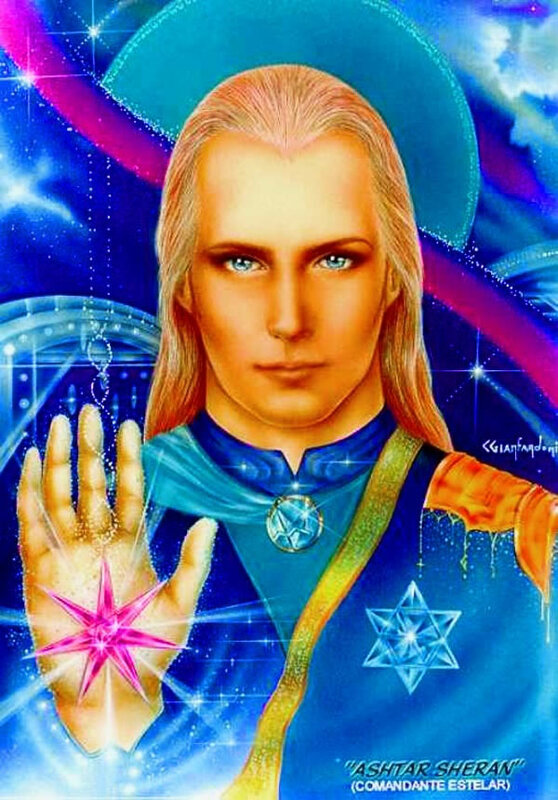 Ashtar Sheran operates in all dimensions of life, and in complete harmony and cooperation with the cosmic hierarchy of the Solar System and the Galactic Council of the Milky Way, which is spiritually animated by the cycle of the galactic centre at Sagittarius. Nothing that I could possibly put into words would ever be able to get even close to adequately conveying the energy of this cosmic intelligence. I am fully aware of this limitation, and I am also fully aware that it is not up to me to try to prove or disprove anything. If this space intelligence makes him openly known in the near future, then it is my hope that eventually this website will help clarify a few points. I have no doubt that, should the Commander and his team come down and introduce themselves openly, they will also provide us with further clarifications, including a further explanation on the law of Karma (i.e., action and reaction) which have prevented them from coming down openly until now (see Q&A section for further details on the levels of help that can and cannot be offered due to this important cosmic law). As for people charging money for “consultation” with cosmic beings and using their names to make claims and predictions, we urge you to be careful (see project III). In our day and age one needs to learn to separate the wheat from the chaff more than ever. Many intelligent thinkers have rejected the “wheat” because they could not see it shining amongst an increasingly deceiving background of “new age rubbish”! Inner education and diligent open minded research including metaphysics are the best way we know to lift the veil of deception. To close, we present below a couple a portraits which offer a reasonable description of what this being may look like. As with words, the images are only a faint attempt to capture the glorious light which emanates from this great being. Bearing this limitation in mind, I can confirm that from my several meetings with this intelligence he indeed has great resemblance to both portraits. Through studying the different energy patterns noted in my out of body travel log I have been able to determine that Ashtar’s “physical” appearance can vary greatly depending on the type of work being conducted. Indeed, I have also seen him appear differently compared to the images we present here, which unfortunately I do not have the skills to paint. The frequency of the heart chakra unequivocally tells when one is in touch with this intelligence. There is no chance of faking it. The portrait by Claudio Gianfardoni was painted in the early 1990s in Brazil after a person who had direct contact with Ashtar requested the above artist, who is highly clairvoyant, to produce the work. Regarding the portrait by artist Celaya Winkler, I was not able to personally check the circumstances involving its production, but internet sources mention that the work was commissioned in 1979. This artist was also highly clairvoyant. There are several other illustrations and artworks available on the Internet from various sources. People might ask this: if this being is so powerful and so attuned with the greater cosmos in an unlimited way, why would he bother about our backward planet? The answer is this: long ago the higher beings in the cosmic hierarchy have recognized that everything that exists in the universe, materially and spiritually, has come from the exact same source. Even the theory of the Big Bang makes this concept relatively easy to understand, as we all share in our atomic structures chemical elements from the sun as well as from all the other stars, even from distant galaxies. The universe has been created by love and for love, and hence it can only evolve through love. As everything is connected to everything, including the different dimensions, through helping our planet the space intelligences are also helping the whole. This chain or connection between the many dimensions of the universe is the foundation for the ancient metaphysical saying ‘as above so below’. Indeed, the arrival of the Ashtar Command of Light in the year 1952 was precipitated by humanity’s destructive actions through dangerous military experimentation with atomic energy, which was threatening to upset the balance of the higher dimensions in the Solar System if used for further destructive purposes. Importantly, the aforementioned “command of light” is a multidimensional task force which is currently still beyond full human grasp. Needless to say, it does not have an “official” website or representation on Earth. The Galactic Masters do not have preferred or privileged groups and do not run websites. The good work is done intelligently and scientifically (metaphysically speaking) through men and women of good will who sacrifice themselves in order to serve the collective good and the need for inner education and enlightenment of the present day and age. A concise, 21-point summary of the core message of the higher dimensional extraterrestrials is given in the diamond section. We also recommend a thorough study of the Q&A section section as well as the suggested references for a greater appreciation of the work of the extraterrestrials from the higher dimensions. A brief guide on how to identify true cosmic works, discerning them from other types of contribution, is offered in project III. Although this website is for humanity of the Earth in these times of need, I dedicate it to this great Master who, with supreme cosmic love, and out of compassion beyond human comprehension, has been giving me direct spiritual instructions while my consciousness is projected into the higher planes since I was 22 years old. For the sake of record, my first meeting with Ashtar (when I did not know who he was) was on 20th September 1998. We have had a total of eleven major meetings which have been fully documented in my out of body travel log, where all the contacts have occurred through conscious projection during sleep. Most of the contacts occur through patterns of sound, colour and pure spiritual energy exchange, where my sub-consciousness receives the information and spiritual quality of the work that has been done. These documents will be available in case they might be useful for other people to try to understand my association with this extremely refined energy source. My last meeting with Ashtar was on 25th October 2012, and the last time I received a communication from his galactic team was on 12th August 2013 (as of the closing of this text). In this last communication they have transmitted that a new phase of their work is about to begin, in which they will progressively start a fuller disclosure of their presence and mission on Earth. It is my greatest wish that Ashtar and all the cosmic Masters currently working with the Earth will be able to carry their mission as planned, receiving the greatest possible cooperation from the Earth and her inhabitants. This is a very powerful wish in the heart, so that the ignorance, fear and spiritual darkness of our times will be transmuted into a golden age of love, abundance and unselfish cosmic brotherhood for all. Ashtar Sheran as seen by artist Celaya Winkler (USA), 1979, all rights reserved. Ashtar Sheran as seen by artist Claudio Gianfardoni, 1992, all rights reserved (commissioned by Ms. Patricia Campos, Brazil). I, Ashtar Sheran from the space command, am flowing with the cosmic energy responsible for unifying all creation. I am the appointed being who works together with the regional hierarchies, the angelic groups and their inter-planetary representatives. From my perspective, I am capable of infusing a higher perspective of cosmic reality into those beings and collaborators in service, who so choose to request me for this perspective. I belong to the most remote matrix of the cosmos, to the energy called love that is responsible for the total maintenance of the unified aspect of universe. This energy is what permits everything to flow, and is responsible for the evolution in all aspects. Because of my higher perspective of the whole, I have volunteered to act both in the macro as well as in the micro cosmos. As such, I have taken responsibility for the overall cosmic evolution in its many facets. Naturally, I am not alone in such a task. I have at my disposal a wondrous group of workers of light that assist me. The angelic realm, the spiritual hierarchies and the Ashtar galactic command work directly within the evolutionary parameters of light, i.e., within the energy called love that permeates us and gives us nourishment. Because of this, we are all united within the ONE, forming one divine family of cosmic light sustained by love. Ashtar Sheran’s self-description, as telepathically communicated through Paulette Reymond, in her 2009 book “Ashtar Sheran, Welcome to the Cosmic Family”, available in German.